As the summer holiday is upon us, there’s a bright and cheerful mood to the exhibitions across the county. In the Turrill Sculpture Garden’s Summer Exhibition in Oxford’s Summertown (tucked away behind the library on South Parade), there’s a celebration of life and the countryside in summer with a flurry of life-size birds and bigger, created by metal sculptor Diccon Dadey. Expect owls – flying, swooping, landing, and just sitting – either in stainless steel or mild steel, as well as woodpeckers, kingfishers and a couple of surprises. All capture the unique movement, character and alertness for which the different species are known and loved. Most of Dadey’s sculptures are fabricated entirely from sheet metal but some introduce mixed media in the form of salvaged or drift wood to enhance the natural feel of a piece whilst others are made entirely from scrap metal. This reuse of materials and the reforming them into these beautiful pieces of art seems a fitting way of demonstrating the ongoing worth of the materials we so readily discard, and where pieces are weathered rather than galvanised they boast a rich rusty patina. Almost directly opposite in The North Wall gallery space, their July exhibition (18 July until 12 August) is brightly called Blue Skies. It’s a touring exhibition of photographs, the result of a creative project explored hopes, aspirations and transformations of a group of women who have experienced violence in their lives. Their surroundings and perspectives developed through the lens of a camera resulting in a striking series of images taken as the photographers break through previous barriers: they are jam-packed with hope and vibrancy. And it’s Boundaries that feature in a group exhibition from the Birmingham and Midland Pastel Society running in The Jam Factory in central Oxford until 31st July, focusing the exhibition beyond the limitations imposed by their medium whilst allowing for a widely interpretation by both artist and viewer – is a boundary tangible, or invented for example. Meanwhile outside in Frideswide Square, take a few moments to enjoy a series of images made photographer Fran Monks, for the Oxford Festival of the Arts. These striking pictures celebrate the contributions made to our society by immigrants: British-born locals were asked to nominate friends, colleagues, neighbours and associates who were not born in Britain and to whom they would like to say “thank-you” and through this thought-provoking series we can all welcome and revel in the rich mix of cultures living in and passing through this ancient crossroads of a city. You can also see a fun selection of more pocket-sized bird sculptures (on biscuits…, yes you did read that right) by Lorraine Berkshire-Roe in the window of Broad Canvas art shop on Oxford’s famous Broad Street, just along from the Tourist Information. Cheeky and colourful, they look like the might fly off at any moment. 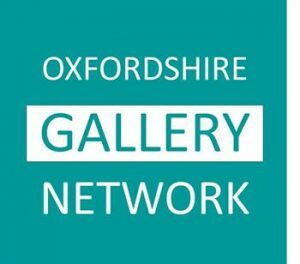 And last but not least, for a different ‘escape’, twenty large abstracts burst from the walls of the West Ox Arts Gallery in Bampton this month (until 29th), many with poetic titles that reflect their energy and mood. With this dynamic exhibition, artist JB Lowe has settled into a new direction stylistically with an increased use of white in his work, the light covering strongly coloured layers below, reds, oranges and turquoises for example, and it’s almost as if you’re looking out of an aeroplane and through the clouds you have intriguing glimpses of what is below. Interested in the process, rather than representing scenes he sees, Lowe paints boldly with a squeegee in oils on board, and then scrapes away only part of the paint layers to reveal the hidden depths beneath: it is what’s left behind that is important in the final work which capture a feel, a flavour or an experience rather than a depiction of something tangible. And they’re worth the trip!